In 2016, Mercedes-Benz’s GLC premium-compact crossover/SUV was new. In 2017, it’s expanded. What was initially a simple choice between rear- or all-wheel-drive in the turbocharged 4-cylinder GLC300 now adds two sloped-roof “coupes” and a higher-performance AMG version of the original wagon-body design, the GLC43. All of the new models for ’17 come solely with AWD. Consumer Guide® got to sample the long-roof GLC43 that injects more performance into a vehicle with a roomy passenger cabin and a good amount of convenience and safety technologies. 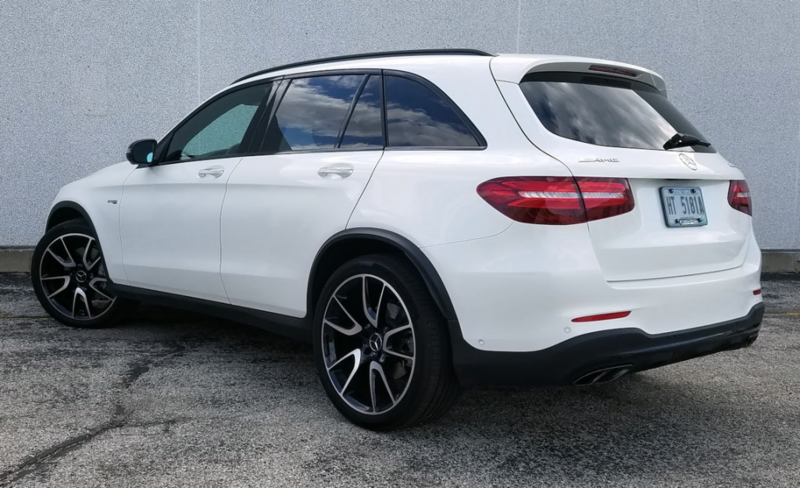 The GLC43 comes standard with a power liftgate. The blacked-out roof rails, rear diffuser trim, and exhaust tailpipes seen here are part of the $200 AMG Night appearance package, which also includes black front-fascia elements. This GLC with the AMG treatment starts at $54,900, or $13,750 more than a GLC300 with 4MATIC all-wheel drive. 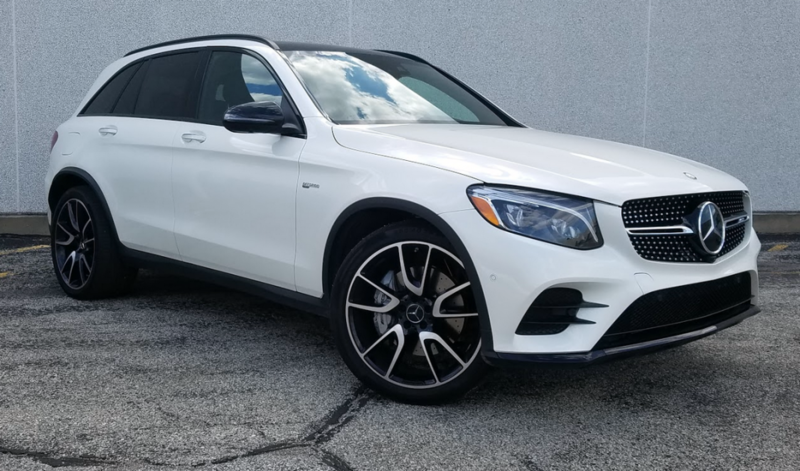 The literal driving force behind that difference is the GLC43’s 3.0-liter turbocharged V6 that develops 362 horsepower at 5500 rpm and 384 lb-ft of torque at 2500 revs. Then, too, there is the performance-tuned exhaust, numerically higher 3.69:1 axle ratio for quicker getaways, larger-diameter front brake discs, automatic load-leveling, and staggered-width tires on 20-inch alloy wheels. Drivers grip a flat-bottom sport steering wheel and view specific dial faces and a vehicle-function display that includes a lap timer. The GLC43’s cabin is suitably sporty to start, and our tester was spiced up further via MB-Tex upholstery with red contrast stitching (no charge) and AMG carbon-fiber trim ($1150). Sporting appearances are maintained on the outside via a deep front air dam and flared side sills, black exterior accents, and a distinct grille design. Inside, the standard MB-Tex seat upholstery comes with microsuede inserts and red contrast stitching, and brushed metal rests on the pedal faces. Heated front seats and satellite radio that cost extra in the GLC300 are included in the GLC43. The V6 is smooth and strong—the manufacturer claims the 4145-pound vehicle will go from 0 to 60 mph in 4.8 seconds. When the DYNAMIC SELECT lever on the console is toggled into “Sport” or “Sport+,” changing shift points and throttle response for quicker acceleration, a gutty sports-car-like purr trails behind. (It’s a bit curious that there are Sport settings in a Mercedes vehicle badged AMG. That label used to signify that any car it was on was nothing but “sport mode” from the moment the key was turned.) “ECO,” “Comfort,” and “Individual” are the remaining choices. The GLC cargo area is on par with class rivals… overall volume grows to 56.5 cubic feet with the second-row seats folded. All GLCs come with a 9-speed automatic transmission (programmed for quicker manually selected paddle shifts in the GLC43). When operating in Comfort mode at lower around-town speeds, the trans seemed to want to run up through the gears in a hurry, interrupting the flow of power. This seemed less pronounced under brisker acceleration or when in a Sport mode. You have to suspect that the transmission is programmed to quickly reach higher gears that are stingier with fuel. EPA estimates for the AMG GLC43 are 18 mpg in city driving and 24 mpg on the highway, and this driver didn’t even do that well. His test drive of 136.9 miles, 69 percent of it in city-type driving, averaged 17.61 mpg. The GLC does have a prominently felt fuel-saving stop/start feature; it’s active in all modes except Sport+ but can be turned off. 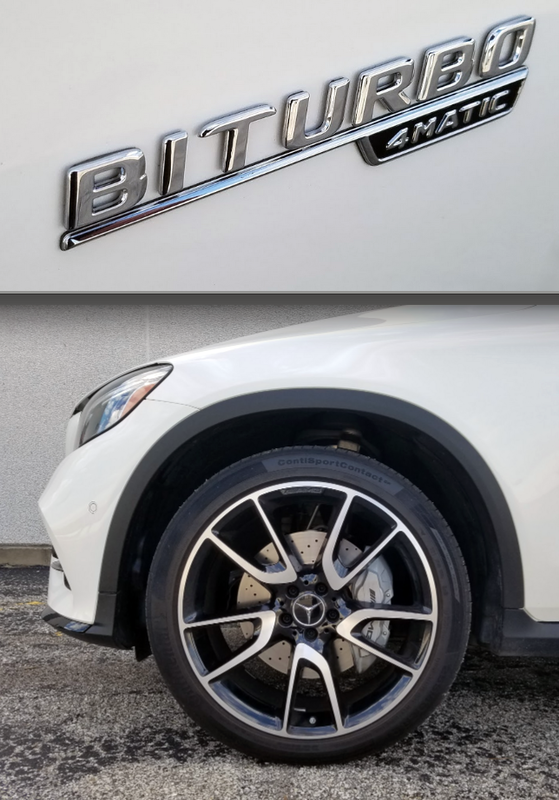 Front-fender badges announce the GLC43’s twin-turbo, all-wheel-drive status. Beefy 21-inch AMG twin-5-spoke wheels with black accents are a $1000 option. The Sport modes also firm up the steering a little bit for a better sense of control in faster driving. It’s not as if there’s a lot of loose play when in Comfort mode, though. The AMG folks have tweaked the AWD system with a torque-delivery bias towards the rear wheels to maintain good power delivery in cornering or hard acceleration. Ride quality came in a bit stiffer on the GLC43 than it did on the very comfortable 2016 GLC300 that CG tested. Certainly the optional 21-inch wheels on the AMG job had some influence on that. Then, too, the adaptive load-leveling air suspension varies firmness and ride height depending on which drive mode has been selected. Standard safety features include collision mitigation, driver-fatigue monitor, rearview camera, and Crosswind Assist. Convenience and comfort items run to a 14-way power memory driver’s seat, dual-zone automatic climate control, power-folding 40/20/40-split rear seats, power-folding side mirrors, power liftgate, keyless and remote starting, anodized roof rails, HD radio, and Bluetooth phone interface and audio streaming. The test vehicle was by no means confined to standard equipment. In addition to the bigger wheels, some of the other options on it included carbon-fiber console trim and brushed-aluminum dash and door trim that helped transmit the high-performance vibe, a two-row sunroof with power shades, hands-free capability for the power tailgate, cabin fragrance system, COMAND hard-drive navigation, Burmester premium audio, voice control, and a touchpad controller for the console-centered COMAND system. COMAND is one of this reviewer’s least-favorite things about any M-B that has it. There is just so much attention-robbing tomfoolery associated with it. Being able to essentially spin the radio dial with a drag of a finger over the touchpad is an improvement of sorts, but you still need to divert your eyes to the central display screen to make sure you’re getting the setting that you expect. In the GLC43, the red-stitched MB-Tex leatherette on the seats (leather is optionally available) is reprised on the dash and door panels. In fact, squeezable soft material extends all the way down the front doors, though the lower portion of the rear doors has a hard-plastic surface. A good-sized and well-positioned glove box and a deep, covered console box handle storage for personal items. All four doors have storage pockets with room for bottles. Pouches are attached to the backs of the front seats. Front cup holders rest under a panel at the front of the console, while rear cup holders pop out of the pull-down center armrest that has a shallow covered bin. Front-seat occupants enjoy good head- and legroom—even under the sunroof, which takes up a bit of overhead space. Rear passengers will find an acceptable amount of legroom, and will have a little less noggin-clearing space overhead. The ample rear cargo space loads roughly at bumper height, and offers some small-item space under the floor. Rear seat backs fold virtually flat for lots more space. The middle portion can serve as a pass-through for long objects. The Mercedes-Benz GLC is a nice way to move people and things. With the AMG GLC43, you can do that faster. For an SUV, the GLC has a fairly rakish, low-slung profile, but still manages to offer decent passenger and cargo room. Written by: The Daily Drive staff on May 4, 2017.on March 22, 2019.